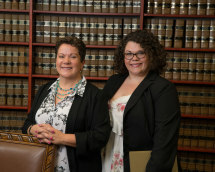 Together, our attorneys have more than 15 years of legal experience. In addition, our founder, Christina Stahl is a former U.S. Army Reserve military intelligence officer. Her experience in intelligence ensures that she will fully investigate our clients' situations before building strategy individually tailored to fit their needs. Whether your legal need is the result of an upcoming divorce, a recent arrest or an unexpected injury or loss, the attorneys at the law firm of Stahl & Hidir, P.C., are ready to help you. If you would like to discuss your legal issue with a member of our team, you can do so by scheduling an initial consultation at our law office in Cartersville.